NetSuite is the favorite technology of most of the startups. Its ERP/financial suite is one of the top most choices of the technological companies that understand that the key to unlocking and managing growth is the back-office systems which will address the challenges of the future. It is an answer to the various problems. There are over 1200 software companies which trust NetSuite for providing a critical foundation required in the future for business processes. NetSuite has a track record for hyper-growth of the company. It has been continuously giving power to the software industry hottest IPOs. NetSuite is meant for all kinds of company whether small or big. It helps in increasing efficiency with comprehensive, global financial and accounting core for improving the visibility as the business evolves. It also helps in eliminating the costly and ineffective manual processes. Rapid growth is the ultimate motto. The quick and rapid implementation gets you up fast and running. It has been built by using the best practices to ensure success from Day 1. The built-in processes are created according to the requirements of the industry. It has some value-driven dashboards and KPI’s which are also tailored as per the industry requirements. With the cloud, delivery eliminates the on-premise IT costs and also provides the automatic updates so that your software is always up-to-date. This system will always enable your team to stay agile and flexible be it any industry or business type and in any corner of the world. It's single unified business management suite, encompassing the ERP/Financials, CRM, and e-commerce is what will help you to grow at every stage. This ERP is designed by using the leading practices and years of experience in the cloud ERP implementations. 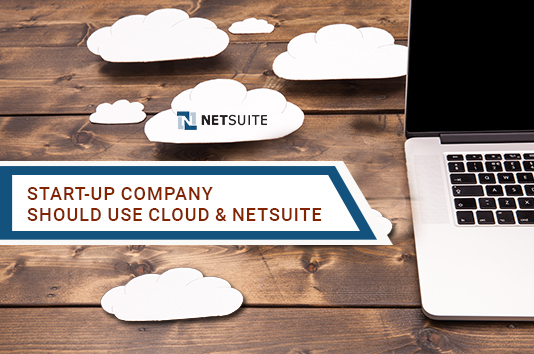 As a startup, NetSuite is the #1 cloud ERP solution which will help you to grow. We at Inspirria Cloudtech, are here to help you. You can take us as your secured cloud provider partner and NetSuite solutions with a decade plus of experience working with 450+ Cloud projects. We push productivity to its optimum level with some proven solutions that are used by best companies all over the world.